By adding facebook like box in blogger blog it could play an important role for blog & website. The more you will get likes the more you will have blog traffics, Readership & facebook friends. Unique way to promote to your sites, blog posts with billions of Internets users in instant of time. A single post could rank well in all popular search engine once try to publish it on several social sharing Sites. like Facebook, Google plus, Pinterst, Google Plus Page, facebook group. and many mores. So i would recommended always use Facebook box inside blogs. It will not only increase your friends engage to your blog but also a prominent way to boost your bog posts. So here we will provides some piece of code of the default facebook like box. We have changed a little codes inside it to make it perfect look. By adding this codes into your blog you have successfully added a new style Facebook box without border. We hope that this tutorial would help you alot to implement this beautiful fancy facebook like box without border for blogger blog. We hope that this could make your blog professional & more attractive. I have tried my best to prepare this little tutorial. If you have found any problem in implementation, then do not hesitate to ask for help. Your response will back soon. Do not forget to share your ideas with PBT. Facebook is one of the best sites that used as a social media promotion platforms. Increasing facebook fans is must for every site to gain really targeted traffic and no doubt this type of stylish facebook like box attract readers to become our fan. Yes ankit bro facebook is most popular social sharing website. it is the no1 alexa marked sites ever on the internet. So we must try to publish each post on facebook. to make all this work easier we should try to have a facebook like box in blogs. because it will increase our fans counters. after thats we could easily share out posts with billions of bloggers. Thanks alot for your nice comments. Yes Dear its will increase thousands of fans in a short durations of Time. Newbie should must put this awesome facebook like box in blog/website. Have a great time with Saqib Ahmad thank you for visiting us. Exactly brothers, facebook matters. And it is also important to publish articles with a short explanation that attracts users and it is must for every blogger to use social networking sites for better traffic. Tharun Raj Brother thanks for your valuable comments. You will be considered one my loyalest reader if you leave your comments without blog link. Try to leave purify comments without blog link promotion. Thanks & hope to see you here with next tutorial. You are right dear this is one the best & newbies helper tutorial. In this way they could easily put facebook box without borders in theirs sites, blogs. Thanks Mohammed Yaqood wanna see you here all the time. Very nice tutorial bro Hafeez. Adding a Facebook like-box to a blog makes it more easier for your readers to stay upto date with your latest posts, which in turn increases blog traffic. Thanks for sharing. Thanks Victor Bro we agree with your words. By adding facebook box in blog website it will increase our facebook page fans instantly. Victor bro you are the oldest and top commentator of PBT then why are you leaving your comments with blog links. It will not give you better instead of it you will get penalized by penguin Penalty. Hope you may understand. Very Nice .. This Tutorial Helps Every Blogger For Engaging Visitor To Fcaebook Community Too.Thanks For Sharing Bro. Thanks Aditya Prakash for appreciations. Yes dears the most prominent and Right way to increase facebook page fans is to adding facebook like box in blog. Thats is. Thanks for commenting here on PBT. Thanks A lot. Hmmm nyc widget. one should must add a facebook like box. if he needs a good traffic from the socual sites, Thnx for sharing dear. Thanks for liking our posts. please dear try to add your links without blog link. Thanks Akhil Bro for your appreciation. thanks and hope for landing here again with PBT readers. Really A Wonderful Article. Also I Need One Help. I Need A Nice Facebook Like Pop-Up Widget For Blogger. Pls Get It's Link. Bro We have already share this widget on PBT. just type PBT search engine box >> Facebook PopUp like Box for Blogger your will get. Thanks for visiting us. Oh man you have won my heart by saying such cute words about us. We will also be interact with you forever. Thanks Abdul Bro for appreciation we are happy to meeting you here. Thanks Hafeez Brother for sharing stylish Facebook like box widget. i am already using Facebook box. It's great way to promote our business and website. phr bhi thank itni zabardast post likhne ka. mujhe ap ki writing skill bahot achi lagi. word asan or us ki tarteeb. I tried to implement the trick in my blog but its not working. 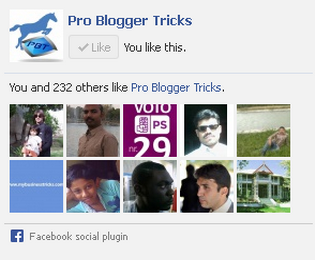 I also changed 'ProBloggertricks' with my facebook username but i am getting only a blank screen in that frame. Hi Hafeez, yeah thanks for the post. Social pages are most important to promote website, blog, products etc.